Today was the final day of the Strava Trail Runner 100 mile challenge and, while already well past the 100 mile target, I had been battling all week to get the number one spot for the UK, which I just managed by running another 26.2 miles today, and then an easy 5km recovery run on the way up, just to make sure. I didn't even reach half the mileage of the overall winner, who clocked up 373 miles over sixteen days! 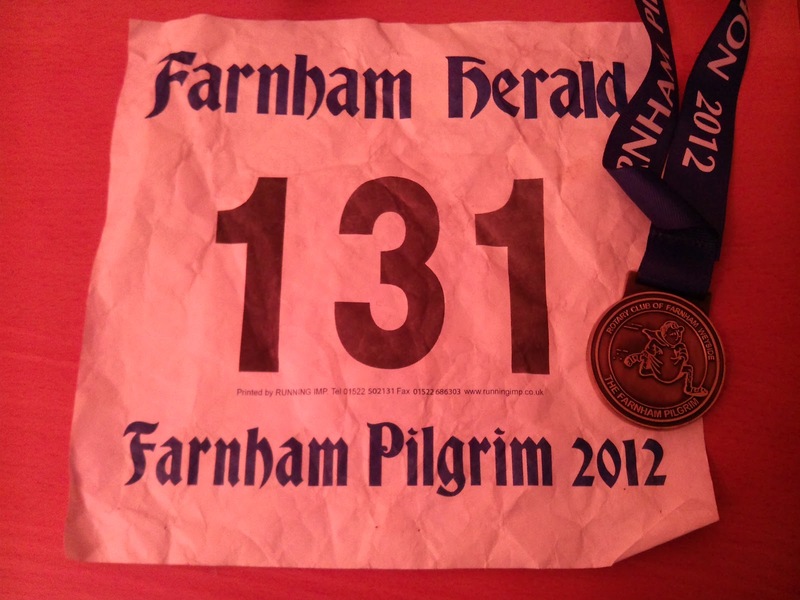 Back to the Farnham Pilgrim. I'd picked up a flyer for this one back at the Trionium Picnic and had to run it in my hometown, not that it started in Farnham itself, rather starting out at the nearby village of The Sands and immediately heading away from Farnham, west along the North Downs way, past Guildford and then back on a mostly parallel route. Nice touch, mostly avoiding just turning around and coming back all the same way. The first couple of miles went badly, with a shin splints like pain in both shins. Having run 157 miles in the fortnight leading up to this marathon I knew I was overdoing it, and my body had been giving me warning signs for the last few days. The pain disappeared after 3-4 miles and never came back, and I felt strong for the rest of the run, really holding my pace over the last hour for a strong finish. Unusually for a trail marathon, this one was extraordinarily well marked and marshaled. With no map or directions there was never any danger of getting lost - almost every junction, however minor, had a marshal or clear arrows to guide the way. This was a lovely course, with great views across the North Downs, a tough old climb on sand up to St Martha's church and plenty more deceptive climbs - they looked small on paper but with the constantly changing terrain they kept wearing away at my energy. I carried a 330ml water bottle, refilled it a couple of times and mixed Gu electrolyte tablets in, which did the job of keeping me hydrated nicely. Those tablets really do seem to work well, despite being outrageously expensive. Here's the route on Strava. I had a nice strong finish on this one, which felt great, passing several people over the last few miles to complete my 42nd marathon in 4:09:51. I'm on a break to recover from the 186 miles I ran in the challenge now, but hope to be back to marathon running in November.